Are you a mom who is looking to save a couple extra minutes each day? Then you may want to invest in a baby bottle warmer. Today we are reviewing the Nuby One-Touch 2-in-1 Electric Baby Bottle Warmer & Sterilizer. The Nuby One-Touch 2-in-1 Electric Baby Bottle Warmer & Sterilizer features an one-touch design, which makes it easy to operate. Because it is an electric warmer, it retains all the nutrients, unlike microwave warming. Since it is electric, you also won't need to buy batteries. This bottle warmer can warm breast milk, formula, and baby food. It warms the milk and food evenly and safely. This product can also be used to sterilize bottles and pacifiers. Simply use the measuring cup to add water, place the included lift-out basket into the warmer, and put the pacifiers/bottles in the basket. The measuring cup is included as well. Also, always place the bottle in the basket when warming. Do not place the bottle in the warmer without the basket. Once done, allow the bottle to cool for 10 minutes. This warmer should fit all sizes, shapes, and brands of bottles. One-touch means it's fast and easy to use. Electric warmer retains vital nutrients unlike microwave warming. As of this writing there were 45 customer comments and 26 answered questions for the Nuby One-Touch 2-in-1 Electric Baby Bottle Warmer & Sterilizer. I've read through the customer feedback, and then condensed the results into this review. I hope that this helps you when shopping for a baby bottle warmer. "I have also used it to heat up water for a small cup of tea. It seems VERY hot and perhaps breast milk users might want to be sure to keep an eye on the temperature of the milk. Certainly keep out of the reach of children while it is on." "My main issue with it was the temperatures are difficult to make consistent. You would think after 8x's a day for a few weeks it would be simple to know how much water to use...but no. Any small variable in time you leave it in the warmer before taking it out can make the difference between having it be too cold or piping hot. I often have to run it under hot or cold water afterwards to have it right where I want it." "Our family travels a lot, and when having a newborn it could be challenging. I brought this item to sterilize my baby bottles and now I use it everyday instead of the big sterilizer. So useful!" You really can't beat the price of this bottle warmer. Some other brand names are 4 times this price. If you are wanting a basic bottle warmer without having to spend a lot, definitely consider the Nuby One-Touch 2-in-1 Electric Baby Bottle Warmer & Sterilizer. "Had this for approximately 2&1/2 months-used it maybe 10 times because baby is primarily breastfed-and it just quit working-just quit turning on-had to run to the store late evening to buy a new one." "The first one I ordered worked for 2 days then all the sudden it would not turn on. The replacement I received did not work either. Very disappointed but for the 2 days it did work, it worked easy." 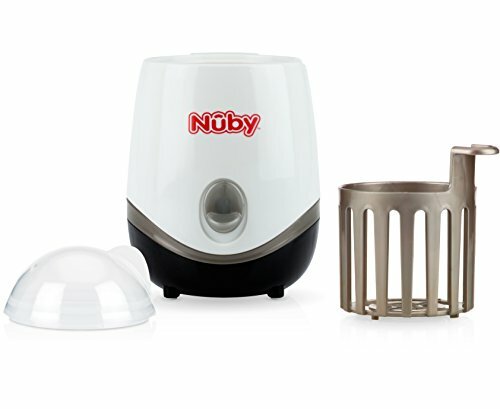 The Nuby One-Touch 2-in-1 Electric Baby Bottle Warmer & Sterilizer is an inexpensive bottle warmer that heats bottles quickly. If you don't keep an eye on it, it could heat your bottle too much. Some customers even used it for heating tea. The heating times can be very inconsistent, so you will need to monitor it each time. This is a great size for travel. The longevity is questionable with many customers reporting their bottle warmers breaking shortly after they bought and used it. If you want a very inexpensive bottle warmer that you don't mind keeping an eye on, you may find success with using this one. I hope that my review of the Nuby One-Touch 2-in-1 Baby Bottle Warmer & Sterilizer can help you decide if this bottle warmer is for you!